Simpson London in Canning Town is one of those rare things in British menswear: a shining new and dynamic factory. I’ve visited dozens of British factories over the past 10 years, and although many of them have character in spades, they are often tired, uncomfortable places to work. Simpson’s new operation is not in a particularly nice part of London, and is one unit in a small industrial park. But inside, every craftsman has a large, well-lit bench to themselves. There is space to move around, to communicate, and to consider things like efficient workflow. 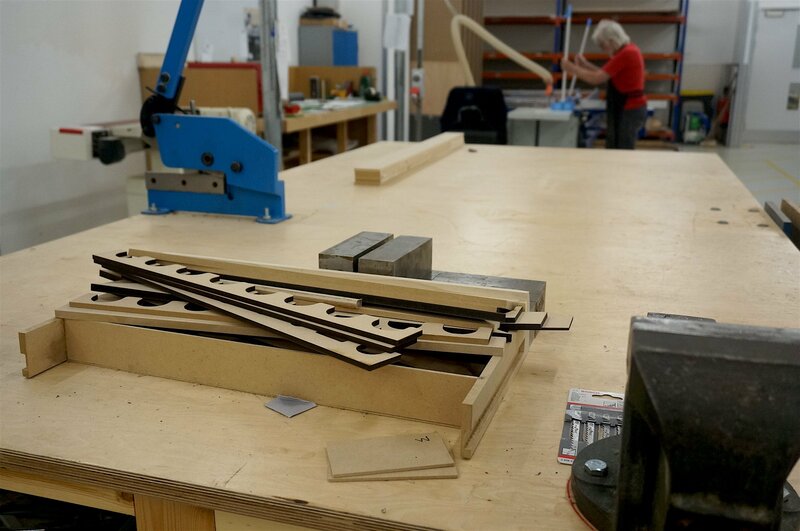 They put in a mezzanine for the workers (and offices), and now use the level below for carpentry, storage and leather stock. The history of Simpson is a little complicated. 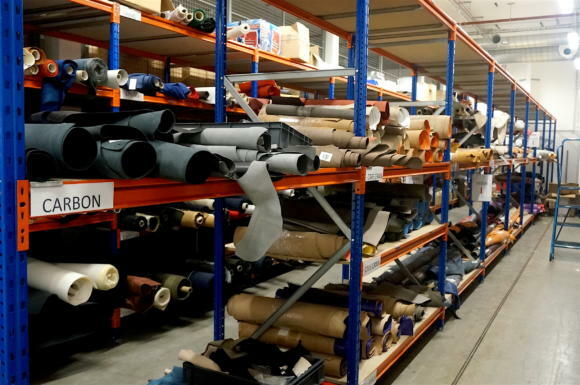 I first visited their factory in 2011 (see post here) at the invitation of Tanner Krolle. It was a ramshackle but charming place, and one of only a handful of places doing hand-sewn leather in London. 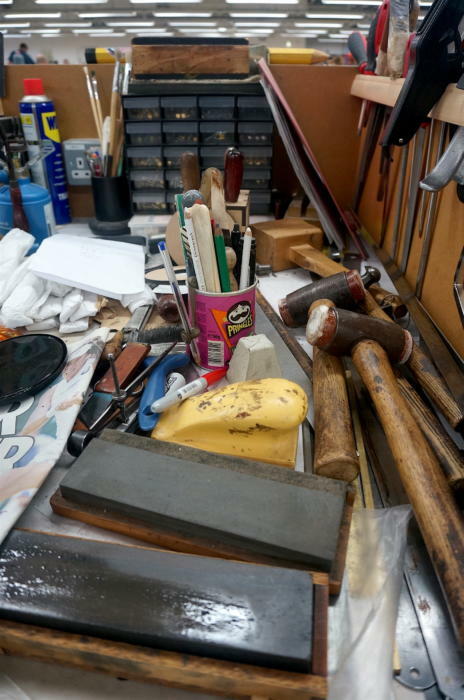 Robert Simpson had set it up in 1997, and it became the place where any high-end bag or shoemaker in London sent small orders to - including Foster & Son and Cleverley. “I’ve sold Simpson-made products my whole life,” says Andy Murphy, who joined Simpson as business development manager last year from Foster & Son. Robert sadly passed away in 2013. A few years earlier William Asprey (founder of William & Son), who was also a big customer, bought the factory rather than see one of his main suppliers go under. William has been the driving force behind it ever since, including the creation of a ‘Simpson London’ brand (largely sold in Japan, but now expanding) and the move in 2016 to this new factory. I’m discussing the history with Andy as we tour the ground floor, looking through the stocks of bridle leather (which unlike most leathers, has to be stored flat). 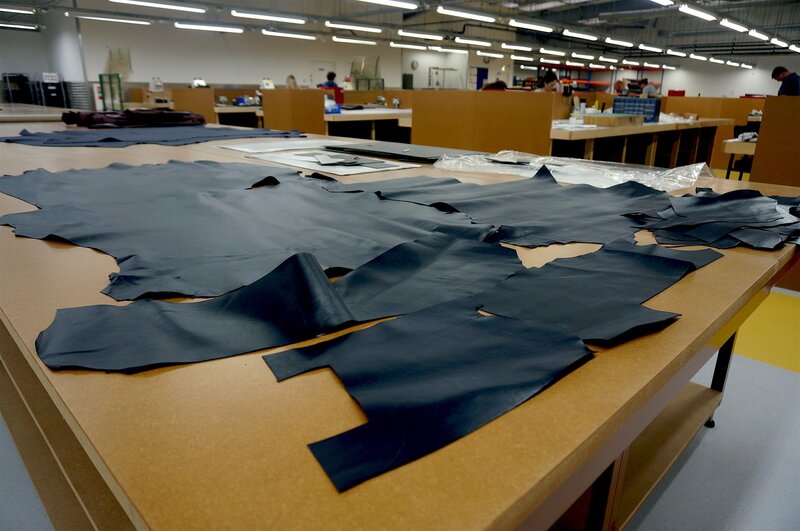 “One of the things William insisted on when he bought the factory was that we had to have leather in stock - good supply, so we could deliver consistently,” he says. Next door a large, modern machine is set up to split leather to any required thickness. 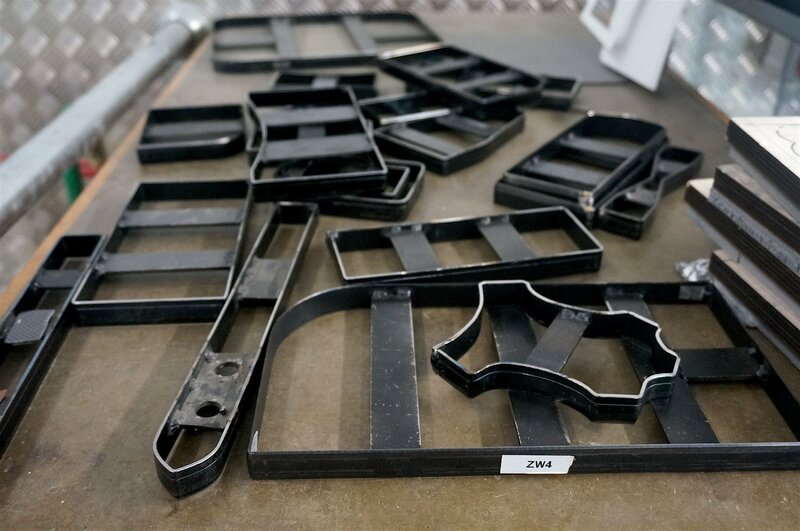 And although press knives (above) are still created for every piece, large runs are all cut with a laser-cutting machine upstairs. The next room is my favourite: the carpentry. 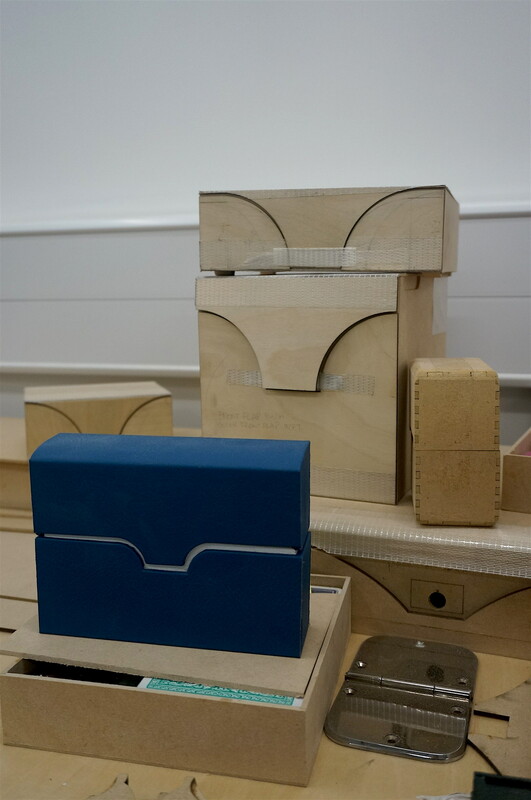 Here wooden frames are made for attaché cases, games sets and jewellery boxes. But there is also a lot of design and prototyping. John, the head of the department, potters around showing us various things in development. 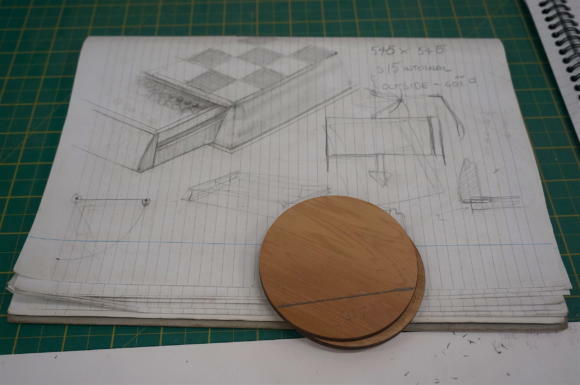 “We’re cabinet makers really - making boxes to be covered in leather,” he says. “But there are also so many interesting new ideas. Upstairs on the main floor, the bag designer is being filmed by a film crew from a large brand - to show how their new women's handbag is made. Everyone else is busy in their wide (and widely spaced) workspaces. 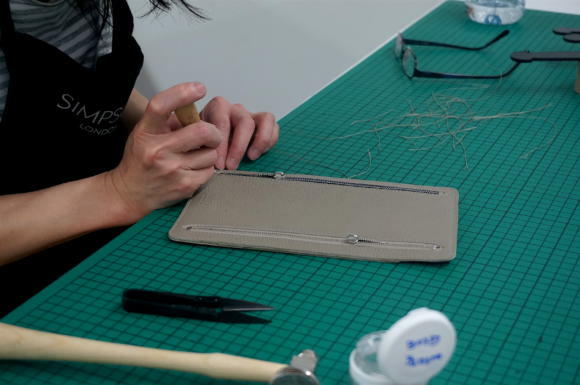 There is still a fair amount of hand-sewing going on, but orders for traditional attaché cases or doctor’s bags are rare. 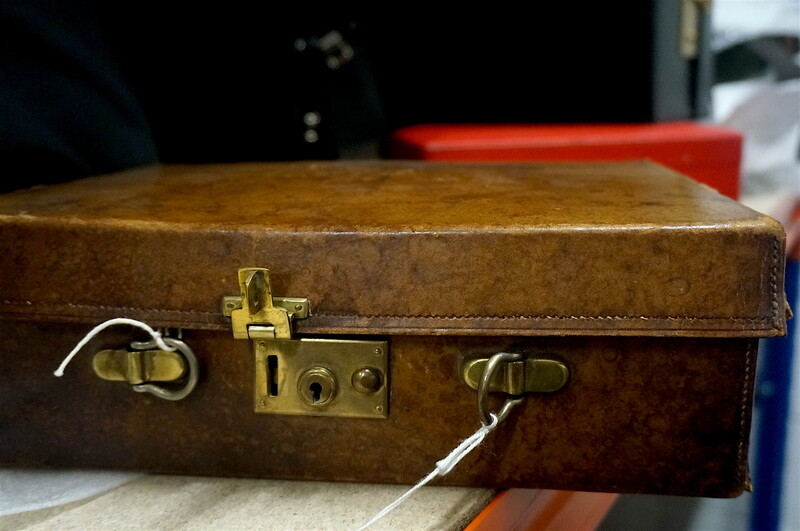 Instead, hand-sewing is sometimes applied to other items, such as cases with nylon bodies but bridle-leather bases. 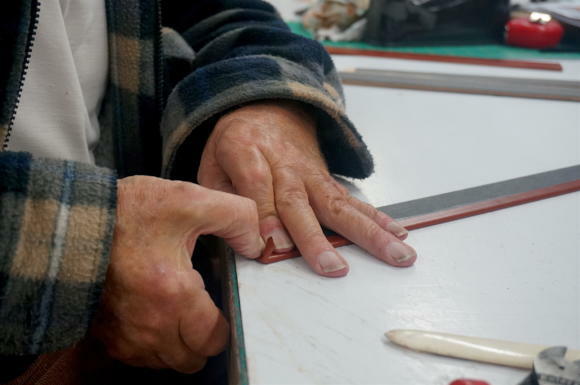 And although the inking of leather edges is done by hand, again there is a new machine to speed up the drying process. 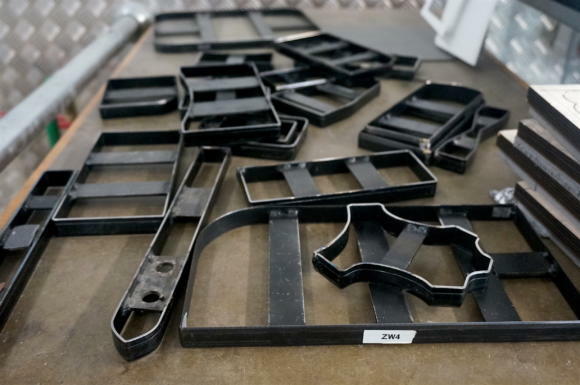 “It was such a bottleneck having dozens of pieces lying around, drying,” says Andy. As we look round the brand showroom Patrick talks about how pleased he is to have so many young people working in the factory. And about implementing an apprentice scheme. From a customer's point of view, it’s interesting to see how broad the Simpson London range is, including games sets and luggage, plus soft leather pieces normally associated with French or Italian brands. “This Pitti Uomo is only the fourth year under the new brand,” says Andy. “It's been interesting to see the reception - particularly as the offering has grown." 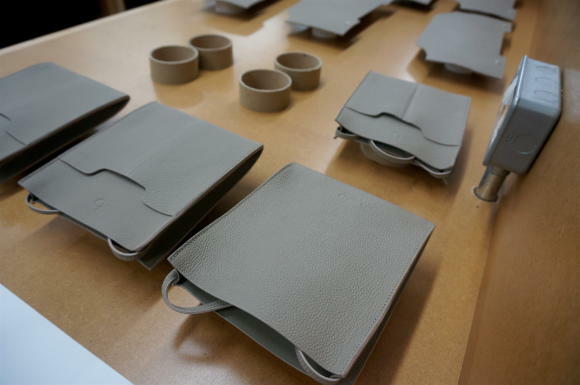 You can follow the discussion on Simpson London leather goods – Factory visit by entering your email address in the box below. You will then receive an email every time a new comment is added. These will also contain a link to a page where you can stop the alerts, and remove all of your related data from the site. They’re set up as a wholesaler at the moment, not a retail brand going to end customers. And a wholesaler or manufacturer wouldn’t have public pricing. That’s clear – makes sense. Do we know which brands they sell to? Otherwise I guess it’s the bespoke option with them? Thanks. Many can’t be publicised, but it includes the likes of Fosters and Cleverley as mentioned. Their own brand will also be more widely available next year. On a seperate note – are you around he pop up store today? I might visit this afternoon. No worries – I did go, lovely shop. I purchased another one of your Friday polo and some goodies from Fox brothers. All good. Catch you another time. I’ve bought direct. Cumbersome is an understatement but they offeredwhen I e-mailed and asked for stockists. Very happy with the end result. As good as swaine adeney for instance but 2-300 pounds cheaper. Dear Simon, recently I have been wondering if and how the “law of diminishing returns” applies to fine clothing, shoes, etc.? For instance, presumably St. Crispin’s shoes are better than C&Js, which is reflected in the difference in price. Yet what about bespoke shoes from Stephane Jimenez, which I read begin at €6000. Is the better quality found in the upper-eschelon category of shoes worth the increased price? Or, does the law of diminishing returns apply after X euros? Where, would you say, is that price mark? The same applies to suiting, etc., and I am wondering if you have any thoughts? Thank you. On the topic of shoes and suppliers… I understand that GC’s standard RTW shoes are made by C&J and are closely comparable to their handgrade own products despite the ~10% premium for GC. Is this true to the best of your knowledge? Yes you’re right on C&J Bob, but I’d counsel against making such quick conclusions. C&J make for quite a few brands, and often those brands will request specific things like leathers or designs which make the shoe more expensive.